Vivekananda International Foundation: State Funded Political Ad Campaigns or PSYWAR? The U.S. Department of Defense defines psychological warfare (PSYWAR) as. "The planned use of propaganda and other psychological actions having the primary purpose of influencing the opinions, emotions, attitudes, and behavior of hostile foreign groups in such a way as to support the achievement of national objectives." Apart from enemy countries, PSYWAR has also been effectively used by despotic, totalitarian regimes and military dictatorships in several countries to mislead their own people and subvert their knowledge base, whether it be by the junta in Pakistan from time to time or the Communist regimes in China and erstwhile Soviet Union. PSYWAR has been highly criticised, particularly, when used on the domestic front, as it seeks to misuse the tax payers’ own money to mislead him and project as true information that are contrary to facts and ground realities. With barely a year to go for the General elections, television audiences and newspaper readers across India are being bombarded day in and day out with advertisements tom tomming the “achievements” of the UPA Government. With an initial allocation of Rs 180 crore, the ad blitz 'Bharat Nirman' has been penned by veteran lyricist and ruling UPA nominated MP, Javed Akthar and filmed by Pradeep Sarkar of ‘Parineeta’ fame. According to reports, the government has spent about Rs 16 crore to produce the television advertisements.. The theme song, a jingle titled ‘Meelon hum aa gaye, meelon hume jaana hai (We've come a long way, we have a long way to go)", has been sung by well-known singers Shaan and Sunidhi Chauhan. Composed as 45-90 second clips, the advertisements are being rolled out in three phases. Recently, a finance ministry panel approved another Rs. 630 crore in the 12th Five Year Plan for the campaign. The Department of Advertising and Visual Publicity (DAVP), the Information and Broadcasting Ministry’s nodal advertising agency for various ministries, will get the lion’s share of the money for creating campaigns at district, state and national levels. Notwithstanding sharp criticism from the opposition parties with regard to misuse of public funds for “political propaganda”, the Government maintains that the publicity is aimed at ensuring that the benefits of central government schemes reach the targeted people so that they actively participate in government programmes. “The main theme of the campaign is dissemination of information about the government schemes”, claimed the proposal put before the finance ministry’s committee. Besides, funds have also been allocated to the Press Information Bureau, which disseminates information related to government policies and programmes to the media, to highlight the “achievements” of the UPA government at the block level. Indigenously built robots, a growing network of metro railways in big cities, easier access to higher education, and other schemes feature in these professionally crafted advertisements. However, the inherent political bias becomes apparent even at a casual glance. For example, in the case of Delhi, the credit for the development of the metro rail is given to the Sheila Dikshit-led Congress government (though the proposal for the Metro rail was mooted by the BJP Government in Delhi led by Madan Lal Khurana (who also acquired the land and set up the Delhi Metro Rail Corporation), sanctioned by the Deve Gowda-led Government and the first trial run was inaugurated by then Prime Minister Atal Bihari Vajpayee of NDA). Interestingly, in the case of Bangalore and Chennai, the ‘Bharat Nirman’ advertisement gives credit to the UPA government at the Centre. Apart from Opposition parties, even civil society organisations and NGOs have expressed their reservations about some of the claims made in these advertisements. It seems the authorities of Bharat Nirman, a programme for rural infrastructure development being implemented by the Union government, are not aware of the facts or of how farm labourers have been converted into bonded labourers in different States, media reports quoted Kiran Kamal Prasad, State coordinator of Jeevika, as having stated. He said the claims of Bharat Nirman that the job scheme had become an instrument of major social change made no meaning to these bonded labourers in the region. Similarly, critics are pointing out that while making a broad generalisation about the youth, Congress leaders often tend to forget that it was the youth which formed core of the Anna Hazare campaign for the Lokpal, and the spontaneous protests at India Gate in the aftermath of Delhi gangrape case. The campaign has also sparked off speculations as to why the Congress would initiate the campaign a year ahead of elections and whether the polls are actually closer. Incidentally, half of the money allocated for the campaign would be spent till March 2014, around the time the model code of conduct would come into force, as the current Lok Sabha’s term expires on May 31, 2014. Smart tag lines and catchy slogans of political parties have often captured the imagination of the people, whether it be Jai Jawan Jai Kisan’’ of the Congress in the 1965 polls, Indira Gandhi’s “Congress Lao, Garibi Hatao’’ slogan in 1971, Janata Part’s ‘Indira Hatao, Desh Bachao’ in 1977, Congress party’s ‘Jab Tak Suraj Chand Rahega, Indira Tera Naam Rahega’ in 1984, ‘Raja Nahin Fakir Hain, Desh Ki Taqdeer Hain’ for V P Singh in 1989, BJP’s ‘Mandir Wahin Banayenge’ in 1989 and ‘ Abki Bari Atal Bihari’’ in 1996, UPA’s ‘Congress ka Haath, Aam Aadmi Ka Saath’, RJD’s ‘Jab Tak Rahega Samose mein Aaalu, Tab Tak Rahega Bihar mein Lalu’ in 2000, NDA’s ‘Pandrah Saal, Bura Haal’ in Bihar in 2005 or Bahujan Samaj Party’s social engineering slogan, "Haathi nahi ganesh hai, Brahma Vishnu Mahesh hai" in the 2007 Uttar Pradesh Assembly elections. But there have been exceptions as well. In the 2007 Uttar Pradesh Assembly polls, people outrightly rejected the ruling Samajwadi Party's advertisement featuring Bollywood icon Amitabh Bachchan mouthing the ironical words, "UP mei dum hai kyunki jurm yahan kum hai", when crime and lawlessness had become the hall mark of the state. The Mulayam Singh Yadav-led party was decisively routed. 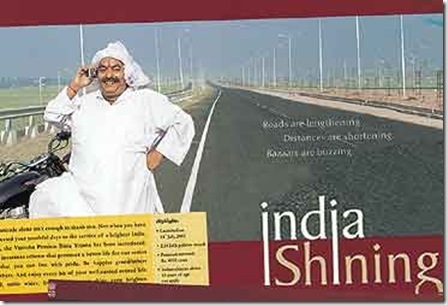 Almost a decade back came one of the most disastrous of such campaigns - NDA's Rs 100 crore 'India Shining' campaign. Creating hype was a different thing but if the creator himself starts believing in it, then the results are obvious. The super confident BJP cadres did not even bother to distribute voter slips at the booth level and thereby offered unexpected victory to the Congress party on a platter. Party veteran L K Advani himself acknowledged later that the India Shining slogan was "inappropriate" for an election campaign. The advertisements, many felt, just did not take into account the social and economic realities and projected an utopian image of the country which just did not exist. It is but natural that ominous comparisons are sought to be made between the two campaigns. As was the case during the NDA regime, the Bharat Nirman campaign is being funded by the government, and not by the ruling coalition, at the tax payer's expense. India Shining was touted as a marketing slogan aimed at hard-selling the optimism of an economy on the upswing, Bharat Nirman is being projected as an attempt to restore the feel good factor of the 9% growth story. If the NDA campaign, masterminded by key strategist late Pramod Mahajan, had hired a leading ad agency Grey Worldwide to design its campaign, the UPA has gone for big names from the Hindi film industry such as Javed Akhtar. Notwithstanding the self-righteous assertions to the contrary by the ruling coalition, a closer look at both the ad campaigns reveals the similarity in theme and content, whether it be about the economic upsurge, price stability, free education, expansion in roads, telecom and other infrastructure et al. The only exception is the UPA’s ads on social conhesion, a packaging of its ‘secular’ card. The timings of the two campaigns too have great similarities. While launching the India Shining campaign much ahead of the due dates for the Lok Sabha polls, NDA leaders maintained that it was primarily targeted to attract foreign investments. Subsequently, buoyed by the victories in some Assembly elections, the leadership advanced the polls by six months and as they say, the rest is history. Ironically, during the ‘India Shining’ campaign, Congress party and other critics of the NDA had lambasted the Vajpayee Government for a “totally wasteful expenditure which could have been spent on developmental works’. Forget ‘India Shining’, ahead of the 1996 Lok Sabha polls, the very same Congress party under the leadership of P V Narasimha Rao had launched a video campaign, “Congress sarkar ka yeh uphaar, paanch varshon ka sthir sarkaar” directed by none other than noted film maker Mani Ratnam. Scores of such videos highlighting the party’s concern for the poor and the underprivileged were telecast not only on the then predominant Doordarshan but also some private channels and cable networks which were still at a nascent stage. The outcome, 140 Parliament seats, was perhaps the lowest tally in the party’s history till then. Refusing to learn from the past, the UPA Government is hoping that the people would get carried away by these feel good advertisements and forget about the endless instances of corruption, price rise, and national security concerns. Undoubtedly, communication plays a key role in elections. It is important for political parties to convey to the people their achievements and their promises, about what they stand for. A sizeable section of the Indian population may be illiterate but they have proved time and again that they are not politically naive. Catchy slogans would have to be necessarily accompanied by visible changes at the ground level. Public perception is built not by television bytes or advertisement campaigns but by real experiences they encounter at the market place, the shops and the streets and in their dealings with the Government machinery at the grass root level. Thanks to a free and independent media and a political aware citizenry, such psychological warfare based on half truths and misleading information have neither succeeded nor likely to succeed in the days to come. Political messages cannot be packaged like soaps and tooth pastes nor can public relations or advertisement professionals replace the booth level communication between the voter and his or her representative. Other democracies including the United States have also witnessed massive advertisement campaigns ahead of elections but the political parties paid for them and not the Governments. Moreover, it has been established world wide that Brands that intrude too much on people’s time with messages they don’t care about are punished by the viewers and readers. A study by former Wharton School Professor Russell Ackoff showed that Anheuser-Busch (BUD) was actually able to increase Budweiser sales by reducing advertising for the brand because, at high spend levels, viewers were becoming annoyed by all the commercials. According to Popelka, Consumers/voters are growing more sophisticated and paying more attention to the advertisers’ motives than ad content. No wonder then that even major corporates have begun shifting ad dollars into charitable causes. If Governments in India too pay heed and spend even half of their ad budgets on providing succour and relief to the needy, it would not only make a difference to the India story but also their political fortunes.